If you’re a regular reader on my blog, you’ll know how much I rely on low carb tortillas to stay on track and make weekly meal prepping as easy as possible. I’ve used them to make all kinds of recipes, from quesadillas to nachos to tortilla chips to these fantastic Fish Tacos! 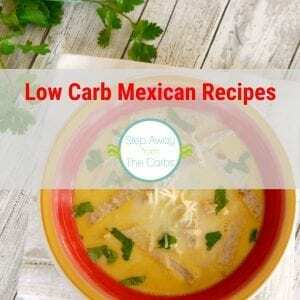 I’ve even used them in a low carb version of a Chicken Tortilla Soup! They are SO convenient and very versatile, and I’d literally be lost without them! They’re great for leftovers, too – got some leftover chili or meat sauce? Just add it to a tortilla, wrap it up, and you’re good to go! My absolutely favorite brand is Mission®, and they offer an awesome range of styles and sizes. These Mission Carb Balance Whole Wheat Tortillas are just 5g net carbs each, plus they’re sugar free and a wonderful source of fiber. Now that we’re at the start of a new year, I know that it’s on everyone’s minds to make the best choices they can when it comes to food. 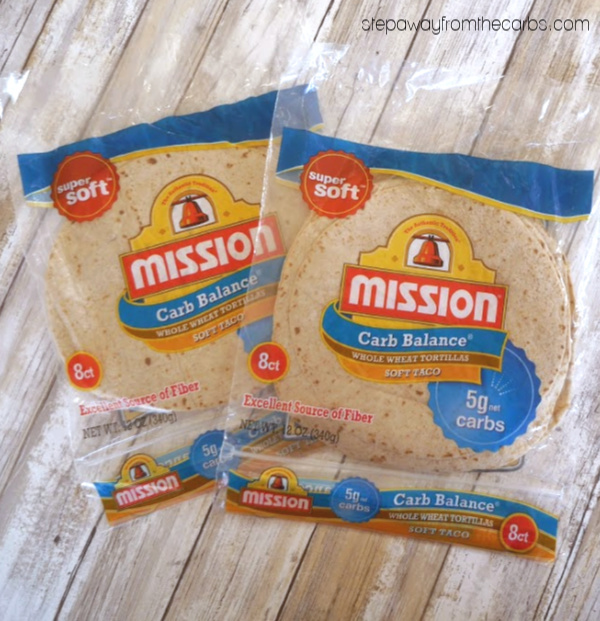 Mission Carb Balance Tortillas are ideal for guilt-free low carb meals – without sacrificing flavor! If you love Mexican food (like I do! 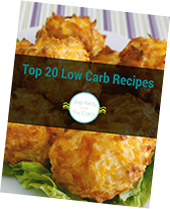 ), then so many of your favorite recipes can be made low carb, just by substituting the tortillas. And I really want to tell you about the Mission New Year, Better Choices sweepstakes! From 1/1/19 – 1/31/19, you can enter for a chance to win gear such as a fitness tracker, wireless headphones or an insulated tumbler! I don’t know about you, but I’ve never been one of those people who skip breakfast. 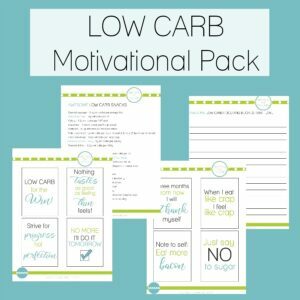 In my experience (and I have been following a low carb diet for over ten years), if I skip breakfast, then I am more likely to snack mid-morning – and it might not be something that’s low carb that’s available – especially if I’m on the go! I use low carb tortillas pretty much every morning: they’re quick, convenient, filling, tasty, and versatile. 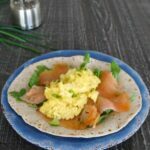 Adding scrambled eggs to a low carb tortilla is not new to me either: my low carb Bacon and Egg Quesadilla is seriously good, but this recipe is even easier! 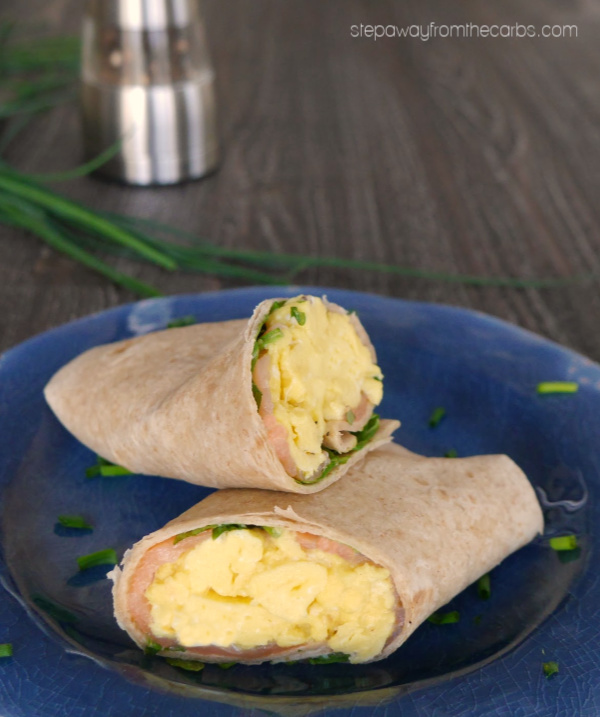 To prepare this delicious breakfast wrap, start by scrambling the eggs. I would usually use five eggs for two people, but you’ll only need four when adding them to the tortilla otherwise it will get over-stuffed. 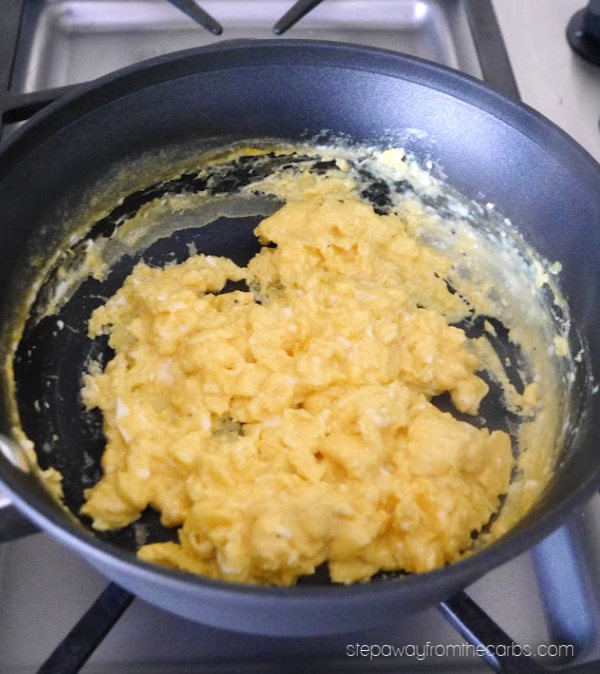 Melt a little butter in a pan, add beaten eggs and a little heavy cream (optional, but oh so good). Season with salt and black pepper. 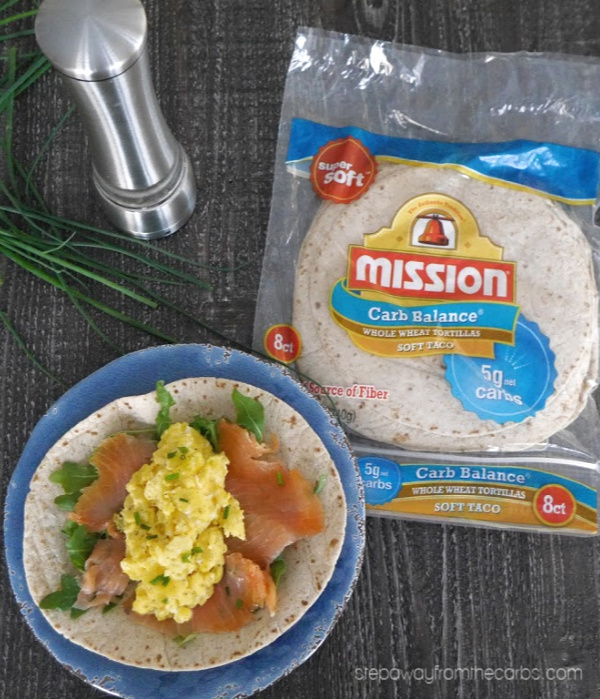 While the eggs are scrambling, warm two Mission Carb Balance Tortillas in the microwave – it only takes a few seconds and it the best way to get the fullest flavor! Add a little greenery to each tortilla – baby spinach or arugula are both perfect. Next, add slices of smoked salmon. Divide the scrambled egg between the tortillas, and finish with extra black pepper and some chopped chives. This dish is an absolutely fantastic way to start the day! 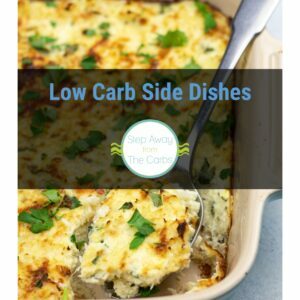 It’s wholesome, filling, low carb, and with absolutely no need to sacrifice good flavor for a satisfying meal! 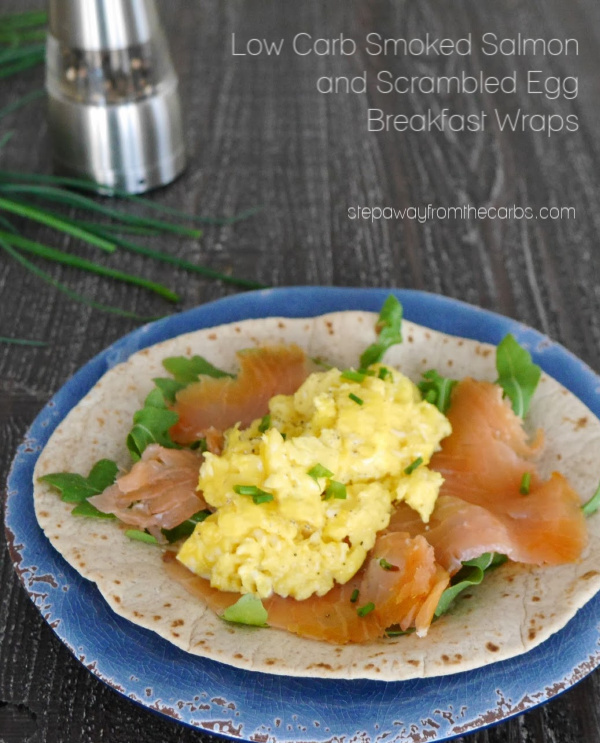 These low carb breakfast wraps are the perfect way to start the day! 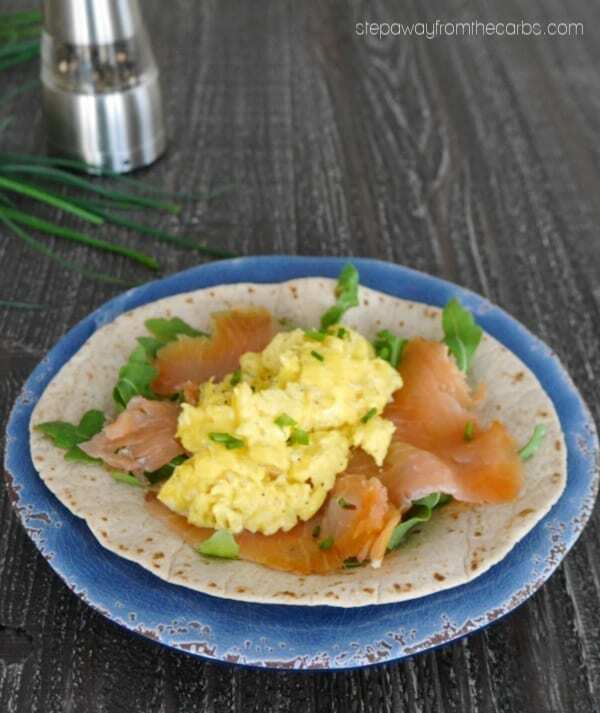 They're filled with creamy scrambled egg and delicious smoked salmon! Melt the butter in a pan, and add beaten eggs and a little heavy cream (optional, but oh so good). Season with salt and black pepper. While the eggs are scrambling, warm the Mission Carb Balance Tortillas in the microwave according to the package instructions. Divide the baby spinach or arugula between each tortilla. Next, add slices of smoked salmon. Divide the scrambled egg between the tortillas, and finish with extra black pepper and the chopped chives. Nutritional data is based on low carb tortillas with 5g net carbs each. Don’t forget to enter the Mission New Year, Better Choices sweepstakes! It’s running from 1/1/19 – 1/31/19, so don’t miss out!